Colombians’ rejection of the peace deal on 2 October led to mass demonstrations in the streets, with people demanding a new agreement, fast. ‘Friends of peace’ in Colombian cities like Bogotá, Cali, Medellín, Barranquilla, and Montería gave voice to the urgent need to find a way out of the post-plebiscite debacle. Meanwhile, Colombian nationals living in the UK who were in favour of the agreements were anxious to express their support for peace, and to heal the trauma of this serious setback: the realisation that Colombia was not yet ready to accept the demobilisation of the members of the FARC guerrilla. Peace rallies and demonstrations have been held in London and other cities around the UK since 2 October. Here are three voices of Colombians who participated: Tatiana living in Colchester, María Inés in Manchester, and Nathalia in Edinburgh. Writing this blog was a cathartic exercise, as each of us found our own way of describing our experiences pre, during and post 2 October. Tatiana Sánchez, PhD student in sociology at the University of Essex, researching children born as a result of sexual violence during times of armed conflict in Colombia. “The people who decided to organise themselves and take to the streets reminded me that there are conversations that we, as Colombians, owe each other.” Gathering in Essex University to support the “Marcha de las Flores” in Bogotá. October 12th, 2016. ‘They’ve killed him. This is the end’, I thought on the 26 September, as fighter jets flew over FARC commander Timochenko just as he was giving his speech at the formal signing of the peace accords in Cartagena, before the plebiscite. Ever since the government announced that the document was ready and that ‘we’, the Colombian people, would have to vote, I feared the worst. Somehow, I kept thinking, ‘we’ are going to screw things up. My biggest fear was not the dark hand backing the opposition to the peace deal, but in ‘our’ inability, as ordinary Colombians, to relate to each other, to see outside our oppressing lenses of class, ethnicity, and gender. Those same lenses that have been so useful in creating dense borders between urban and rural realities. From Colchester, at a distance, my conversations with other Colombians and people from other countries who were following the negotiations were optimistic. Discussing the content of the agreements, and talking about the different possible scenarios for peace, became a constant. My social networks on Facebook and Instagram echoed the same optimism—with very few exceptions (some members of my close family who were against the peace process). And yet, that very same optimistic mood around me reminded me how disconnected ‘we’ Colombians are from each other. We are so used to talking to people who think similarly to ourselves that we have forgotten how to listen, how to talk. The whole campaign, our own isolation, were a reminder that for ‘us’, words no longer have shared meanings – if they ever did. Anxiety. Anger. Sadness. After the results of the plebiscite it was difficult to articulate emotions and arguments. I knew, however, that nothing I could feel matched what victims and combatants were feeling. I was aware of that, and I have never tried to ‘put myself in their shoes’. I tried to understand the happiness that seemed to come from some of those closer to me who had voted ‘No’. I tried to understand what I had missed in their discourse, in their logic. And I failed. ‘This is how far “we” have grown apart from each other’, I told myself with frustration. Watching people celebrating on TV or looking at WhatsApp memes was confusing, and violent. I could not understand what people were celebrating, what people were so happy about. ‘Even if they oppose the peace negotiations they have won nothing. Things just remain as they were. We all lose,’ I kept repeating to myself. I felt isolated. Very quickly in Colombia people took to the streets, and hope came back. Not because they could reverse the results of the plebiscite, but because somehow there were people standing together. Together. Because after all, there was a ‘we’ that was willing to not give up. After all the uncertainty of the last month there is a new opportunity. Cautiously, I feel some sense of optimism, of hope. Nevertheless, I am aware that now it is more evident than ever that ‘we’ need to learn how to talk to other Colombians, probably for the very first time. From different positions, recognising that we are not all victims and combatants. The people who decided to organise themselves and take to the streets reminded me that there are conversations that we, as Colombians, owe each other. Those conversations are yet to happen, but the possibility of having them in a country without armed confrontations between FARC and the armed forces is a hope worth holding on to. María Inés Romero, PhD student Humanitarian and Conflict Response, Peace Education, The University of Manchester. “I entered with a huge smile and voted. 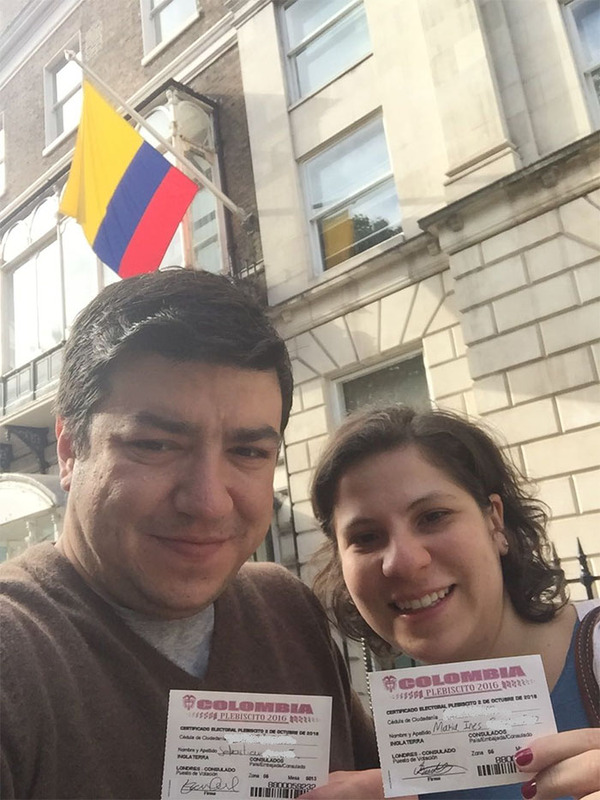 I couldn’t believe that I was changing Colombia’s history.” Selfie taken by María Inés and her husband, Sebastián, after voting in the plebiscite. October 2nd, 2016. I had just started my MA in the School of Leadership at the University of Harvard. My biggest worry was proving myself worthy of the challenge I had set myself. However, history would put an even greater challenge in front of me. President Santos had just announced the initiation of the public phase of the peace dialogues between the government and the FARC-EP. Suddenly, a whole new set of possibilities opened in front of me. What did that mean for my country? For me? How could I play a role in this historical time? The questions just kept coming, and my life project changed. I had to write a ‘Purpose Paper’ for my class on School Reform and I decided to call it ‘Schools for Peace’. With that piece of writing, my destiny was sealed. I embarked on a quest to learn what the role of education in building peace in Colombia could be, and this led me to a PhD at the University of Manchester on Peace Education. My husband and I hopped in the car. Since we live in Manchester we had to drive to London to vote. During our trip we discussed how lucky we were to be able to vote since we had registered our citizen IDs in the Colombian consulate for the previous presidential elections in 2014 and that at the time we thought those were the most important votes we would cast in our lives. We both voted for President Santos, not because we believed in him, but because we believed in the peace process that he was engaged on. Little did we know at the time that that decision would allow us later to vote for what was definitely the most important decision in the history of Colombia: Yes. We decided to make the trip to London a weekend event, and to meet with people with whom we could share thoughts and feelings about the plebiscite, and what the outcome would mean for our country. We talked to Colombians and foreigners about how this was a tipping point in our history. How we still thought the hard work was yet to come, but that at least we had a chance to do the work. We woke up early on 2 October and went to the consulate. As I approached the building I saw the Colombian flag standing proud. I have never been fond of patriotic symbols, but in that moment, my eyes filled with tears. I entered with a huge smile and voted. I couldn’t believe that I was changing Colombia’s history. The hours passed. We followed the news through Facebook and the results started coming in. At first ‘Yes’ was winning, albeit by a very small margin. I started getting nervous. My husband kept reading the results as they came in, I started doing the dishes, I had to do something. Suddenly, I heard “s*@#t”. The final results were in. We had lost. After the horror of losing, the world didn’t end. On the contrary, a new force was emerging in the voice of the students, of the victims, of indigenous peoples, campesinos, political leaders, social leaders, women, LGBTQ communities, Colombians abroad, and many others. Rapidly social media exploded, and the Nobel Peace Prize awarded to President Santos acknowledged the importance of the work that had been done up to now. New, bolder, symbolic, diverse and creative ways of demanding peace for everyone continued to surface. I wanted to be there, drop everything and give my time to the cause of peace. However, I stopped and reflected on the work I am doing, and how it will eventually provide other tools from which to build long lasting peace. I’m a fervent believer in the power of education and I intend to do my part. Nathalia Salamanca-Sarmiento, PhD student in sociology at the University of Edinburgh, researching former child soldiers’ narratives in Colombia as a way to understand childhood during war. “The only way, I believe, to fight despair, was to grieve properly, and to start coming together to have conversations.” Candle light vigil organised by Colombians in front of St Giles Cathedral in Edinburgh. October 7th, 2016. I listened to the Mexican journalist Alma Guillermoprieto saying that it was key to avoid falling into the ‘drunkenness’ of peace. She warned us – a group of Colombian journalists – about the hyper-excitement around the ‘promises’ of a change because of the agreements and warned us to be aware of what was coming: post-conflict is never easy, and it might take decades to a country to achieve significant change. Nevertheless, I fell for it. I resisted it at first, but once the end appeared near (when the Government and the FARC reached a final agreement in September, for example), I fell for it. I was ‘drunk’ with a few friends here (thanks to every live streaming we could find) and with my sister and my friends over there (thanks to WhatsApp). With two close friends, we booked our train tickets from Edinburgh to London in advance, and got a good deal. We were thrilled. Now I can see that it was an anticipated celebration. While in the train on 1st October, we painted our nails, red, blue and yellow, the colours of the Colombian flag, and were full of hope and excitement. I had a parcel from home, which contained the text of the Havana agreements printed in El Espectador (one of our national newspapers), and we read bits from it aloud. We drank beer, met friends, enjoyed the trip ‘to the capital’ and showed up to vote in the morning of 2 October. A day full of excitement, which ended with four Colombians drinking a bottle of aguardiente (also from the parcel from home) on a 7pm train from Kings Cross to Edinburgh Waverley. We thought we would be celebrating by the time we got home. We were wrong. I have said this before, and I stand by it now. The fact that my country said ‘No’ (even by a small margin) to the option of demobilising the oldest guerrilla group in the world, broke me. I grieved for weeks. The first reaction was: hopelessness. It was an emotion I shared with my sister, and with friends with whom I have worked over years to protect human rights in the country. There was a ‘we’ that was devastated and couldn’t find ways around this defeat. It was painful and, at the same time, an eye-opener. The Argentinian journalist Martín Caparrós described the emotion on 3rd October as waking up in a country where we don’t know who we are anymore. And for me, at a distance, in a cold island, that emotion was also strong. The only way, I believe, to fight despair, was to grieve properly, and to start coming together to have conversations. First, as a therapy (‘terapearse’), and later on, as a way to explore creative ways to react to what happened, and to think, truly, about what that new country that we want could be, which we are ready to keep working for, regardless of where we are.